I acquired my first Feld-Hel machine in 2008. It clearly needed some basic maintenance, as the motor was slowing down periodically. This is not unusual for a machine that was built before WW2. After seventy years, the grease in the gears and in the ball bearings has simply hardened and can no longer act as a lubricant. Also, the drive-train made a metal-on-metal noise. Not good! The source of the latter problem was yet unknown. Beyond the 1941 general Operations & Maintenance manual (ref. 1, 1A), no Hellschreiber manual exists (or has survived) that covers this type of maintenance and repair. Late 2008, I finally got my courage up enough to start the disassembly - with "some" trepidation at each new "layer of the onion". I certainly did not want to do any damage to this museum piece. It sure was a good opportunity to get to know the machine inside and out! I captured and illustrated all the steps that I followed to fully disassemble the motor-generator, replace the ball bearings, refurbish capacitors, perform lubrication, re-assemble the motor-generator, and perform final adjustments and test. All of this is available as a detailed and richly illustrated manual: Overhaul of the Hell Feldfernschreiber Motor-Generator. 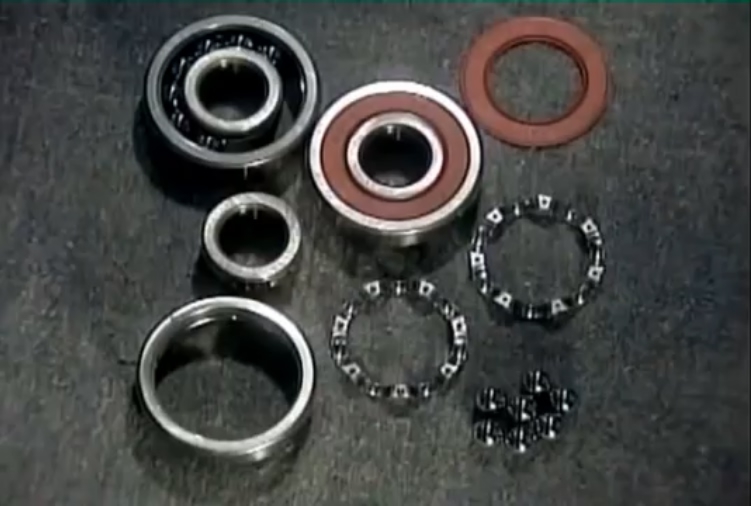 Here I had the choice to clean and re-pack the original open bearings with new grease, or replace them with greased-for-life sealed bearing. 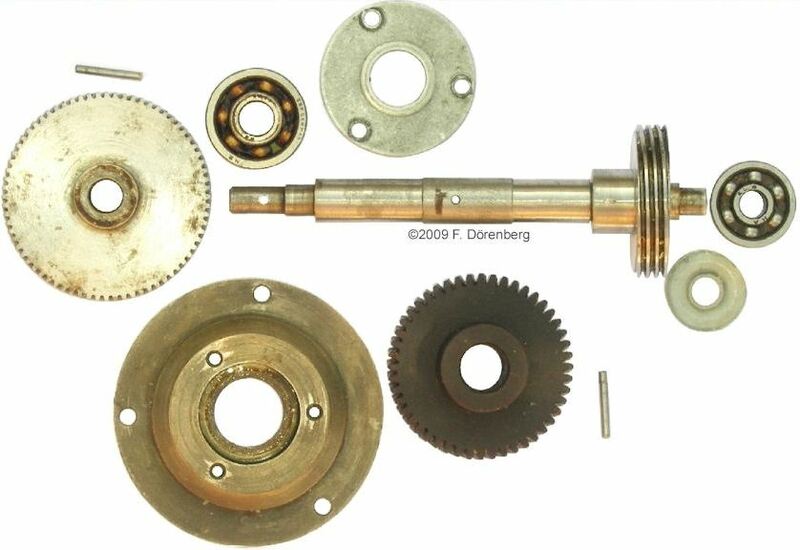 I chose the latter and documented the process in Overhaul of the Hell Feldfernschreiber Gearbox. The electronics part of my machine also needed maintenance: the 900 Hz the tone frequency had moved to 720 Hz, and the 900 Hz bandpass filter needed adjustment. This is also perfectly normal, and is caused by the inevitable aging of the capacitors (mostly the paper & tar capacitors). This is covered in my Tuning of the Hell Feldfernschreiber Tone-Generator and Filter manual. While at it, I documented the Schematic, Component-Layout and Connector Pin-Outs of the Hell Feldfernschreiber. 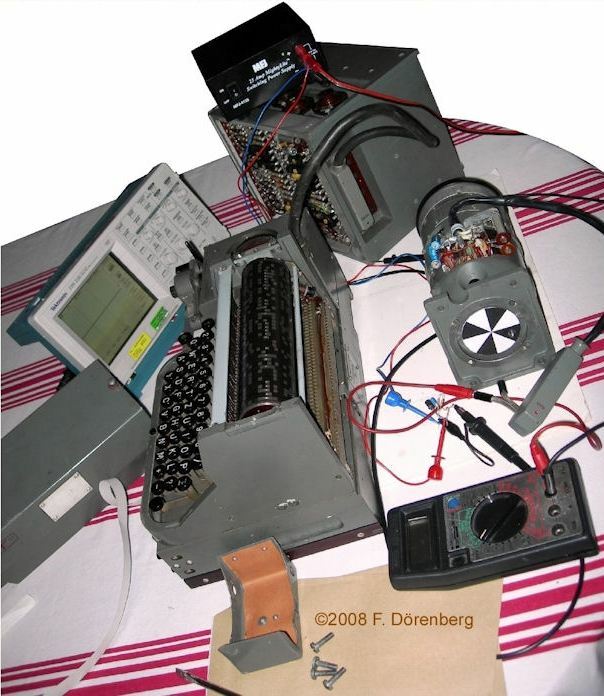 "Schematic, Component-Layout and Connector Pin-Outs of the Hell Feldfernschreiber"
"Tuning of the Hell Feldfernschreiber Tone-Generator and Filter"
"Overhaul of the Hell Feldfernschreiber Gearbox": this is an incomplete early draft document! I have not yet finished writing it! IMPORTANT: I am providing my manuals at no cost to you. They are for general information purposes only. I do try to keep the information up to date, complete, and correct. However, I cannot guarantee the completeness, accuracy, or correctness of the provided information for any purpose. Any reliance you place on the information is therefore strictly at your own risk. In no event will I be liable for any loss or damage whatsoever, that may arise from your use of the information. Late 2012 I acquired a second Feld-Hell machine, and in May of 2013 a third one. The previous owner of the third machine (a Luftwaffe telecom technician in WW2) had (professionally) modified the electronics box of the third machine, to operate it with his amateur radio transceivers. It is on my loooong "to do" list (yes, I do have a life beyond "Hellschreiber") to perform the standard mechanical maintenance on them, and reverse the modifications. If I learn any new tricks, and/or learn from other Feld-Hell owners/operators, I will update this page and the manuals. I will report them here and update my manuals accordingly. Read the manual first, and follow it (yes, I know, this is unnatural for engineers and techies). To prevent damage to original equipment, always use screwdrivers that closely match the screw head, are not worn out! Same for wrenches and other tools. When replacing an electronic component, leave the original in place (de-soldered on one side) and put the replacement part across it. If necessary, put shrink tube or similar isolation on de-soldered component lead. When de-soldering wires (e.g., as required to get into the electronics unit of the Hell Feldfernschreiber or when disassembling the motor-generator), put a numbered piece of shrink tube on the wire ends (and if necessary, write down where the number is supposed to be reconnected, or - better still - mark up a photo. 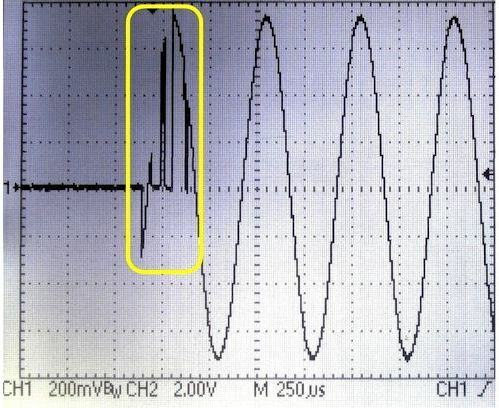 a single winding with a nominal DC-resistance of 4090 ohm. two separate windings on the same rectangular core, connected in series, each with a nominal DC-resiatance of 750 ohm (i.e., 1500 ohm total). This implies a voltage drop across the solenoid of 10 mA x 4 kΩ = 40 volt and 10 mA x 1.5 kΩ = 15 volt, respectively. 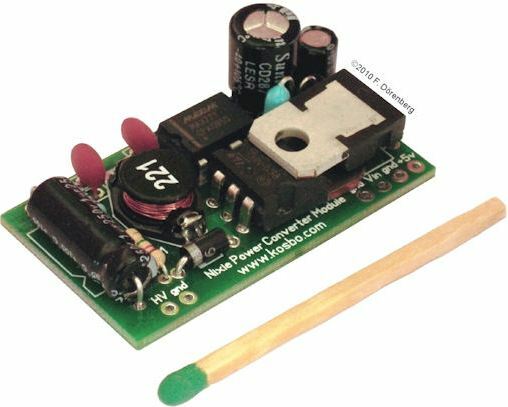 So, to test a printer solenoid, you simply need a DC power supply that can provide at least that voltage. Preferably a power supply with adjustable output voltage and adjustable current-limit (set to 25-20 mA). Note that the solenoid of Presse-Hell printers draws twice as much current: 20 mA nominal, and has a nominal DC-resistance of 350 ohm (i.e., a voltage drop of about 7.5 volt). IMPORTANT: large inductive voltage spikes (several 100 Volt) appear across the solenoid when it is (de-)energized. If you test the solenoid by itself, with a power supply, you must install a suppressor diode across the solenoid ( = across the output of the power supply). Obviously, the diode has to be installed with reverse polarity (otherwise the power supply will be short-circuited), and the diode must be able to handle at least 300 volt reverse voltage. E.g., a 1N4007 or equivalent. Also note that in the Feld-Hell machine, one side of the solenoid is permanently connected to the generator voltage (150 - 185 volt DC). Here, there is no suppressor diode, as the RV12P4000 solenoid driver tube can handle the voltage spikes - so the spikes are there! The schematic below shows a possible circuit design for testing a Feld-Hell printer solenoid, or operating such a solenoid with an external tone-pulse detector instead of the Feld-Hell amplifier box. Several circuit designs for such a detector are provided on this page. At some point, I needed to troubleshoot the output voltage of my motor-generator. To isolate the problem, I needed to provide the Feld-Hell's amplifier box with anode voltage from a source other than the motor-generator. This way, the amplifier box can also be tested completely stand-alone, without needing a motor amplifier (though obviously, the motor speed regulator circuitry cannot be tested this way). The Feld-Hell generator produces 25 mA max at 150-180 volt DC (nominal 165 volt). This happens to be about the same as what is required for 4 or 6 Nixie tubes. I searched the web for "nixie tube power supply", and found several schematics. Ref. 6, 7, 8, 10. Some designs are available commercially, as a kit or fully assembled for about $15 (2016 pricing). The one I bought is a tiny card (2½ x 4 cm, ≈1x1½ inch), with a 180 volt DC output at 21 mA max. The output voltage is adjustable with a fixed resistor. It also has a regulated 5 volt DC output. I don't need the latter, so I hooked up an LED "power on" indicator to it, via a 470 Ω resistor. The generator voltage is applied to the Feld-Hell's electronics box via one of the two 6-pin rectangular connectors that are plugged into the left-hand side of the box. The 12 volt DC to the motor also passes via this connector. Two 6-pin rectangular connectors plug into the left-hand side of the box. The rear one (with the green dot ●) connects the character drum contacts and the printer solenoid to the electronics box. This connector remains plugged in: the anode-voltage powers the solenoid. The second connector (with the red dot ●) carries the 12 volt DC to the motor, and the 165 volt DC from the generator. For stand-alone testing of the electronics box, this connector must be unplugged. Standard banana plugs can be (loosely) inserted into the connector of the electronics box. To avoid plugging the external anode-voltage into the wrong socket, I decided to make a simple full-proof (and hopefully fool-proof) insert. I used a 2½ x 10 cm (≈1x4") piece of an 8 mm thick plastic kitchen cutting board. M5 screws with self-locking nuts serve as guide pins. Two banana plugs serve as connector pins. I drilled pin holes into the side of the plastic insert, through the banana plugs, and inserted a finishing nail into each hole. This fixes the banana plugs into place, so they don't pop out when plugging the insert into the box. Note that the nail heads must be sufficiently countersunk, to avoid shorts between them (e.g., via the housing of the electronics box). To avoid an electrically shocking experience, I coated the heads of the banana plugs with a dab of standard liquid electrical tape. It is important to use a separate 12 volt source for the electronics box and the anode-voltage supply. If the same 12 volt source is used for the electronics box and the anode-voltage supply, the fuse will blow, when switching the main switch back and forth between "Aus" / "Bereit" / "Ein". Note that the 165 volt DC return and the +12 volt DC are interconnected inside the electronics box! 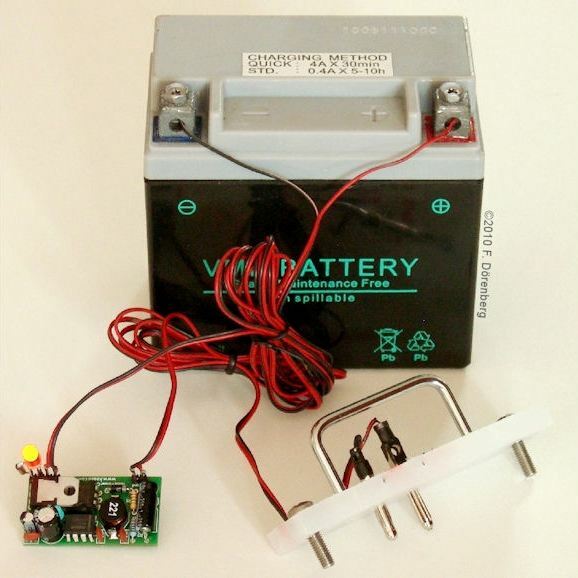 I use a small motor-cycle battery, though a second 12 volt power supply should be fine as well. Also note that the red light on the electronics box will not light up in the "Bereit" position, if the connector to M-G is not plugged in – this is normal. The main switch is switched from "Aus" to "Bereit"; as noted above, the red signal light on the front of the box will not come on! Wait 1 minute for the tubes to warm up. The anode-voltage supply is hooked up and powered up. The main switch is switched from "Bereit" to "Ein". Now we check the anode-voltage with the voltmeter of the electronics box: push the blue button in the rim of the voltmeter. The voltmeter should indicate 180 volt (or whatever the external high-voltage power supply is adjusted to). This reading is without the load of the printer solenoid. To generate a constant 900 Hz tone or 900 Hz Hell tone pulses, any Hell-capable software can be used (see this page). The output of my PC's soundcard was hooked up to the "Empfänger" connector of the electronics box (the La-Lb/E phone-line connector will also work). With the constant tone, the printer solenoid is energized continuously and draws about 10 mA. The Feld-Hell's motor-generator can source 25 mA. My tiny power-supply card only 21 mA, so the voltage dropped. Note: if the external power supply can deliver 5 watts of power (e.g., 28 mA at 180 volt), there should be no voltage drop on the volte meter when the solenoid is energized. The Feld-Hell keyboard has a Morse telegraphy key - the key with the green dot ● on it. Unlike the other keys of the keyboard, this key can be pushed even when the motor is not running. If pushed, the printer solenoid should be energized. If so, the tone oscillator is working (though not necessarily at the correct frequency), as well as the pre-amplifier and the solenoid driver circuitry. If not, hookup a high-impedance headset to the "Mithören" output, and check if there is a tone when the Morse key is pushed. If so, the tone oscillator and pre-amplifier are working. In my motor-generator overhaul manual (ref. 5A), I describe using a very simple home-built optical tachometer in combination with an oscilloscope. While I had the motor-generator separated from the gear-box, I measured its speed with the cheap-and-simple tachometer that I described on my home-built Feld-Hell printer page. I did so, because I already had a scope, and the tachometer was simple to make with parts in my junk box. I attached a simple paper strobe-disk to the pin-coupling of the Feld-Hell's motor-generator. A couple of years ago, I decided to buy an inexpensive digital tachometer (model DT-2236A) on eBay. It can be used optically ( = laser + a reflective strip on the rotating object), or by contact (surface speed or shaft speed, with various attachments). It works fine, and (I hate to admit it), it is more practical than fiddling with my own creation. To get access to the character-drum, you only have to loosen two knurled-head screws and remove th eprotective cover. The conductive nickel-steel patches of my drum looked dirty. Another way to tell whether cleaning is needed, is by listening to the tone-pulsesproduced by the machine (or better yet: looking at them with an oscilloscope), when typing on the keyboard. The signal should be clean, without crackling. 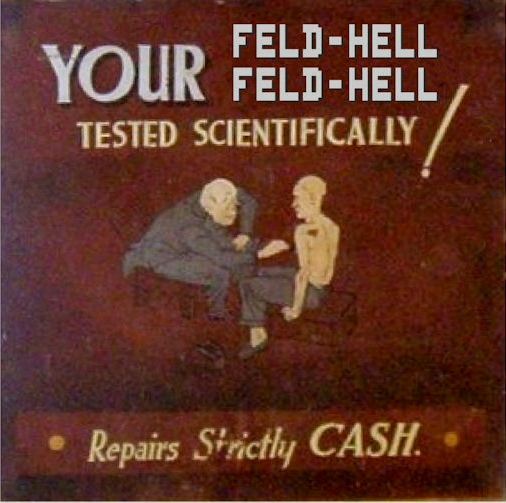 For monitoring purposes and to have a record of the transmitted text, the Feld-Hell machine prints its own output signals. If the drum is dirty (which happens over time and during normal operation), the print-out will also show signs. Note that the 900 Hz voltage across the contacts is very low (only several tens of millivolts), so it does not take much increased contact resistance to become noticeable. This is different from using a much higher pull-up voltage, e.g., when directly keying a CW transmitter via the keying contacts of the 12-pin round connector on the front of the unit. Cleaning of the character-drum is described in line item 98 of the 1940 manual (ref. 1, 1A). It is a simple procedure. Quite a bit of crud came off the drum when I cleaned it, and afterwards, the contact rings looked nice and clean. NEVER turn the drum by hand if it is installed on the Bottom Unit and therefore connected to the gear-box! Only if the Keyboard-Drum Unit is separated from the Bottom Unit, then the drum may be turned by hand. If not, the machine must be powered up such that the motor turns, or the motor must be removed and the input to the gear-box turned by hand. NEVER use any aggressive cleaning products, as this may damage/dissolve the drum! NEVER use an abrasive cloth or kitchen sponge - you will damage the mirror-smooth surface of the metal patches of the drum, and/or the filler material between the patches. Simply use a lint-free cloth and some denatured alcohol ("spiritus" in Dutch and German), or special contact cleaning fluid. The manual actually prescribes what is called for: kerosene (US) or paraffine oil (UK). As a substitute for "Wählschienenöl" I use sewing machine oil. This is a highly refined, light weight mineral oil, without additives, and intended for high speed precision machinery. As it is inexpensive, get a decent brand at your local sewing machine store or fabric store. Fernschreibmachinenöl – teleprinter oil such as Isoflexöl K ("PDP 61A" of the Klüber company (Munich/Germany) - still available today! Fernschreibmachinenfett – teleprinter grease Isoflexfett K ("LDS 18 Spezial A" of the Klüber company). This is a grease with lithium thickener ("soap"), diester and mineral oil. NEVER use WD-40® for lubricating Hellschreiber parts! As nice a product as it may be, it is primarily designed as a penetrating cleaner/degreaser, to loosen stuck parts, prevent corrosion and displace water. "WD-40" actually stands for "Water-Displacement formula nr. 40". The manufacturer explicitly states that it is not intended for parts that move continuously! It is OK for using on door hinges and maybe bicycle chains, but not for fine machines! In September of 2009 I got a hold of a copy of the 1940 Feld-Hell lubrication manual (ref. 2). 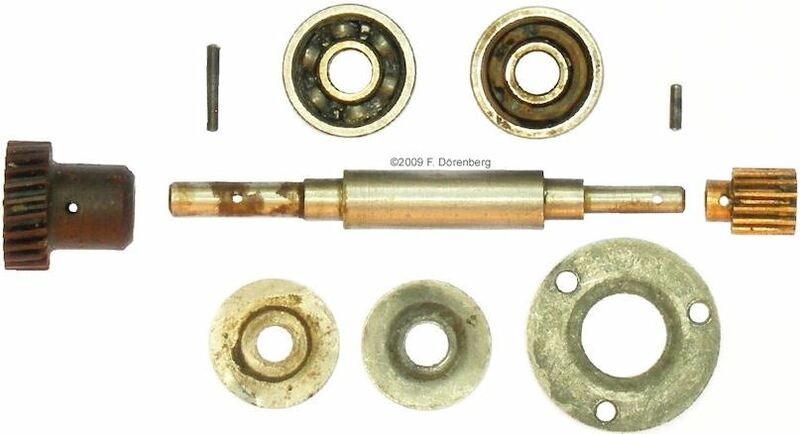 According to this manual, the (non-shielded) ball bearings are to be greased once a year with "Fernschreiber-Motorenfett" (teleprinter motor grease), after cleaning them with "Benzin" (petrol (UK), gasoline (US)). No particular brand or type of grease is suggested. 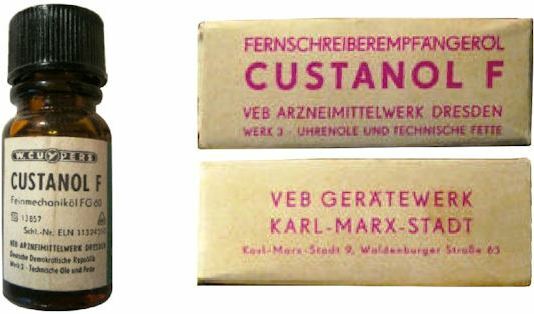 Grease is to be applied to designated points four times a year, whereas oiling is to be done with "Fernschreibmachinenöl"– (teleprinter oil, see above) every 100 operating hours (but at least once a month). Cleaning and lubrication of 50+ points identified in the 1941 manual (ref. 1, 1A, 2); note that this does not cover the ball bearings of the motor-generator, as that was deemed to be well beyond field maintenance. Cleaning the character drum, such that keying of the character pixels has little or no contact noise / crackling / bounce. If necessary, adjusting the motor speed regulator relay contacts, such that the motor is running at nominal speed when the 0-10 manual speed adjustment scale is at 5. Ref. 1A: "The Feldfernschreiber", translation into English of "Der Feldfernschreiber", Frank Dörenberg (N4SPP), 2 May 2008. Ref. 4: p. 10 in "New methods for the evaluation of the lubricating ability of oils and greases", post-war translation to English by the US Combined Intelligence Objectives Sub-Committee (C.I.O.S). of "Neue Methoden zur Bewertung der Schmierfähigkeit von Ölen und Fetten", by E. Heidebroek, Reichs-Verkehrsministerium, Zwischenbericht Nr. 83, April 1940 (C.I.O.S. ref. no. SF3). Source: www.cdvandt.org. Ref. 5B: "Schematic, Component-Layout and Connector Pin-Outs of the Hell Feldfernschreiber", Frank Dörenberg (N4SPP), V1.4, 15 April 2008, 8 pp. Ref. 5C: "Tuning of the Hell Feldfernschreiber Tone-Generator and Filter", Frank Dörenberg (N4SPP), V1.0, 5 April 2009, 26. pp. Ref. 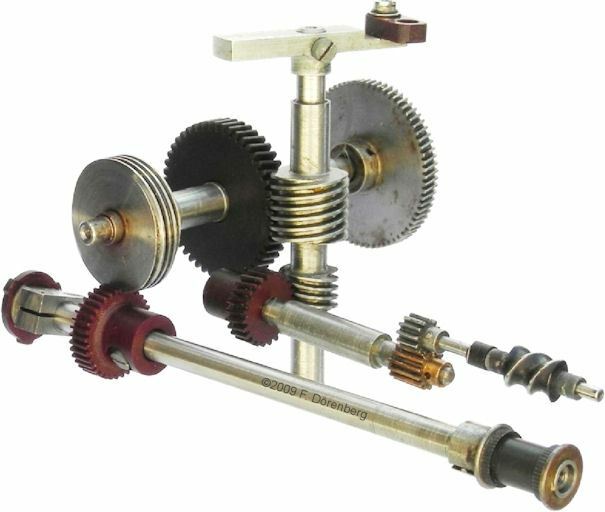 5D: "Overhaul of the Hell Feldfernschreiber Gearbox", Frank Dörenberg (N4SPP), V1.0, 8 June 2009, 80 pp. This is an incomplete early draft document! I have not yet finished writing it!